Get your own copy of this groundbreaking book - available in multiple formats. 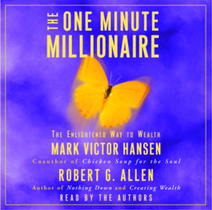 In this New York Times bestseller, Mark Victor Hansen, the mastermind behind the 65-million-copy Chicken Soup series, and Robert G. Allen, a pioneer in bestselling wealth-creation books, share their revolutionary approach to building wealth and present a powerful program for self-discovery. 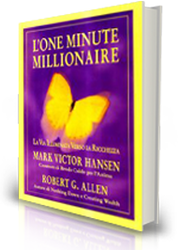 Uniquely organised, The One Minute Millionaire combines inspiring fiction and clear, easy to follow teaching to show you the way to true wealth. Half the book is a fable about a woman faced with a terrible dilemma: Michelle must earn a million dollars in 90 days to keep her family together. In the other half, complementing the fable point for point, are the structure teachings of these experts, presented as millionaire minutes; summaries of attitudes, strategies, and techniques for building wealth, lessons Michelle needs to act upon to reach her goal. By bringing these right and left brain approaches together, Hansen and Allen show how to overcome fears and doubts and leap over the roadblocks that limit potential. Both authors have earned multiple millions through their careers. With The One Minute Millionaire they want to share their knowledge to bring out the enlightened millionaire they believe exists in everyone.